WINNER: The winners will be randomly chosen from comments received on DT member blogs. The winners will be announced on the CDS blog Thursday, July 25th. Looking forward to that hop!!! Ladies your cards are amazing. I trust that lots of folks will play along for their chance to win some great stamps. Just finished the Hop. Fabulous creations from all. Inspirations galore. Thank you. I love your blog hops! Always fun and lots of inspiration. Thanks for the fun hop! Excellent hop! Thanks for the inspiration. I love all the sets! I have commented on all the participating blogs! Thanks for the giveaways!! 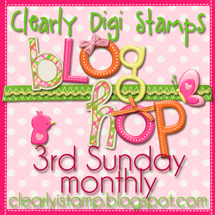 Fun blog hop with great CAS creations. Another wonderful hop. Thanks so much for sharing your crafty friend with us. Great hop...very cute & fun images to use on cards!! Great cards on the hop, lots of fun! The DT all used beautiful digis this week. I really love them all. Thanks for the fun hop! All the ladies did a fantastic job. What a great bunch of talented DT members, TFS!